Us vs Th3m, a campaign group specialising in creating popular satirical websites, have released Wronga. It’s a website that functions in a similar way to short term loans companies such as Wonga, but it gives a clearer picture as to the amount you would owe if you borrow money over a longer period of time. 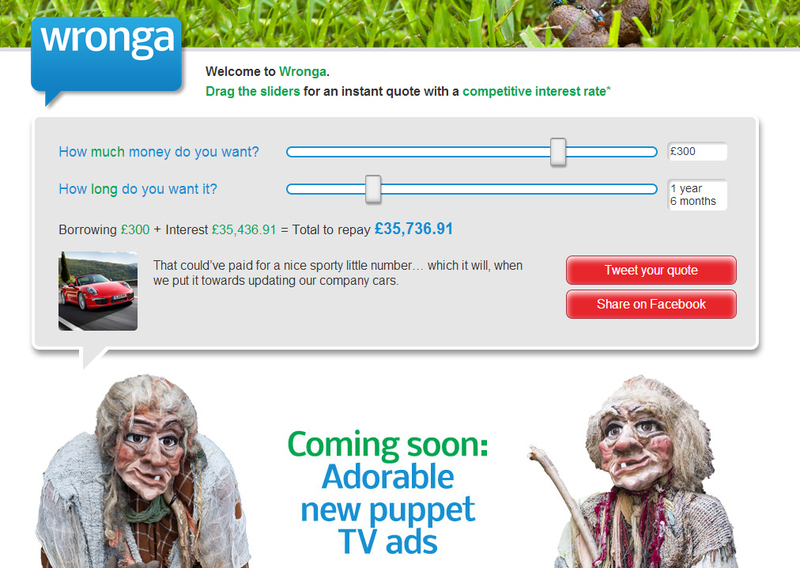 For example, it highlights that if you borrow £10 from “Wronga” for 7 years you’ll owe £48,750,609,537. It’s a clever way to bring to attention to the vast amounts of debt that users of short term loans companies might land themselves in if they miss payments. The creative attention to detail is strong – nestled in the typical corporate-style ‘green grass in website header’ is what appears to be a steaming pile of animal faeces crawling with flies. Nice.